Versatile, extra-light machine for chiselling and break- ing. Used for repairing joints, light chipping, descaling and removing coats of paint or dirt. Versatile, extra-light machine for chiselling and breaking. Used for repairing joints, light chipping, and removing coats of paint or dirt. 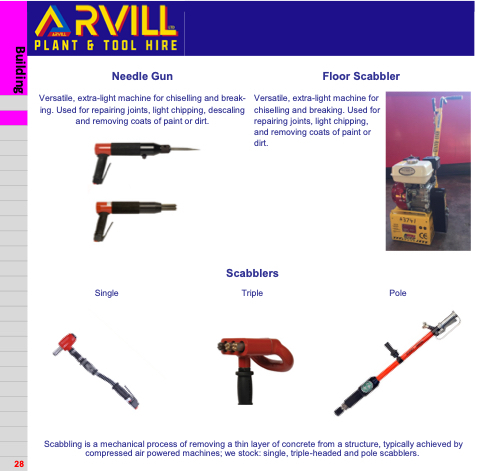 Scabbling is a mechanical process of removing a thin layer of concrete from a structure, typically achieved by compressed air powered machines; we stock: single, triple-headed and pole scabblers.